As I've written about before, one of the easiest ways to save money on tour is to avoid staying at a hotel and simply crash on someone's floor. It's a tradition for DIY musicians and a great idea if you're someone nobody's ever heard of. Most people I've stayed with on tour are really great (see Mr. Let-Me-Make-You-Breakfast or Mr. Cool), but everyone has stories where they would have been more than happy to just sleep in the van for a night. Most people I know who tour would agree that the people I've described here are accurate descriptions of situations they've been in or heard of, so let's take a look at the selection of people you stay with on tour. The relationship between humans and animals has always been a complicated one; somebody's eating somebody. It gets more complicated, however, when one of your bandmates is allergic to cats and you didn't tell us that your precious Jasper shed all over your floor, which we're now sleeping on. Or that he urinated on the first couch I've been able to sleep on all tour, and you never cleaned it up. 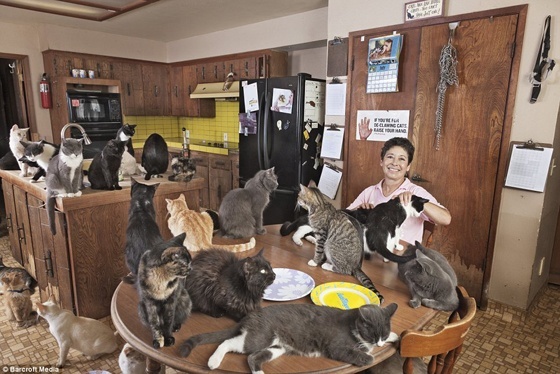 If this is you, get familiar with your homemade cat-mess cleaner solution and don't have guests over until then. Please. Look, I appreciate your hospitality. I always do. But there seems to be a disconnect between certain people who invite guests to stay at their house and the fact that they're staying there so they can, you know, sleep. Back in March, my band stayed with the guitarist of a fantastic punk band I'd known of for some time. We showed up fairly late as he wasn't arriving until after midnight anyway. We met up and chatted and everything seemed fine, but when we decided to go to sleep, he and his friend thought that was prime time to drink wine and blast classical music in the next room over. Needless to say, getting to sleep was hard that night, and unfortunately, we had a nine-hour drive the next day. There's nothing like waking up in a foreign house in an unfamiliar city and finding out that your host has made you breakfast. Whether that's pancakes or eggs and bacon, or some wonderful mixed dish, it's one of the few times on tour that you'll have a homemade meal. Anyone who's ever been on tour will tell you that fast food only goes so far, and while it's a great idea, you'll quickly get tired of PB&J. However, Mr. Let-Me-Make-You-Breakfast understands your basic needs and is an excellent cook. Mr. Let-Me-Make-You-Breakfast, thank you. You not only fed and sheltered us, but you saved us money that we would have spent on Taco Bell breakfast burritos. Sometimes kids who go to shows have the raddest folks. Going to watch your child perform is one thing, but offering your living room floor to four or five sweaty guys/gals you've never met is mind-blowing on a whole other level. If you're one of those parents, thank you! In general, family homes are a lot cleaner than most of the dirty floors bands crash on, and they're certainly cleaner than the van. The place doesn't reek, the house has been recently vacuumed, and the couch doesn't have pee (or something) stains all over it. Of course there are exceptions, but not you, Mom and Dad – you guys rock! Is it cool if I call you Mom and Dad, by the way? I’m sorry for bothering you ma'am, we’ll just find a truck stop somewhere. He goes by many names – Mr. Cool, Mr. Relaxed, Mr. Chill-Dude, Mr. Easygoing – and he's awesome. In Seattle, WA, he took us to his church and bought us pizza. In Fresno, CA, he showed us his collection of guitar cabs and told us where we could skateboard. Mr. Cool is the King of Chill and the King of Friendly. He'll take you to barbeques or leave you totally alone – he doesn’t care! Also, while you shouldn't push your luck, Mr. Cool is usually open to having you stay with him for days at a time if need be. What a swell guy! Some people own guns for protection. Other people are hunters. I have no problem with either of those things. I was raised in Idaho, so that makes up about half of my social circle. What I don't understand is why you have to drink an excessive amount of booze and bring out your weapon to show me. I don't care what the caliber is or what class or if you got your prized buck with it or if you can hit a target from 50 feet or 1,000 feet away – you have five random people sleeping in your living room, and we need you to put the gun away and go to bed so we can leave before you shoot someone. Please, take a gun safety class and don't ever drink and hold a gun at the same time ever again.